On 14 July 2016, UNICEF using eight tankers, delivered 100,000 litres of water to IDPs in Juba, South Sudan. The United Nations today ordered the temporary relocation of some non-critical staff from Juba, South Sudan, due to the operational challenges caused by the recent fighting there. Meanwhile, the main warehouse in the city run by the United Nations World Food Programme (WFP), which held one month's worth of life-saving food and nutrition supplies for 220,000 people before the fighting erupted, has been looted. But UNMISS and UN entities “will continue running critical operations to support the people of South Sudan, including protecting civilians and providing humanitarian assistance,” the spokesperson added. The fighting between the Sudan People's Liberation Army (SPLA) loyal to President Salva Kiir and the SPLA in Opposition, which backs First Vice-President Riek Machar, reportedly killed some 272 people, including 33 civilians, and displaced at least 36,000 civilians. According to WFP, UNMISS peacekeepers have reported extensive looting of food from the warehouse on the western edge of Juba, but WFP staff have not yet been able to reach the warehouse to confirm the extent of the losses. “WFP strongly condemns the theft of food intended for the poorest and most vulnerable people of South Sudan,” said WFP Deputy Regional Director Vernon Archibald. “While the extent of the looting is not yet clear, we fear that the loss of these vital food supplies will severely hamper WFP's ability to assist the tens of thousands of people who have fled their homes because of the violence,” he added. The warehouse serves as WFP's main logistical hub inside South Sudan, and is used to supply the agency's operations in the rest of the country. WFP Country Director Joyce Luma noted that the agency has already provided urgently needed food assistance to thousands of displaced people sheltering at UN peacekeeping bases, using stocks from a smaller warehouse in another part of town. She said the agency is also sheltering some 3,000 people in its main office compound, mostly women and children who fled for their lives. “A new mother fled to our compound with her baby son just hours after giving birth,” she added. “In past incidents of large-scale looting, WFP has been able to negotiate the return of looted food when those who took it recognized the importance of the humanitarian assistance that WFP provides,” Ms. Luma said, expressing hope that such would be the case this time around too. 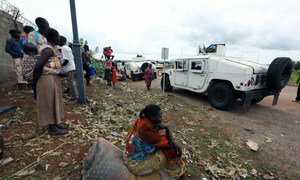 At UN Headquarters in New York, Stéphane Dujarric, Spokesperson for the Secretary-General, told reporters that the situation in Juba, according to UNMISS, was calm but tense with heavy SPLA military presence. The Mission also reported that its peacekeepers continue to undertake limited patrols. Currently, the Mission is protecting some 33,000 internally displaced persons in Juba, most of whom are sheltering in the “protection of civilian” sites adjacent to the UN House, he said. The Mission will also start conducting search operations in these sites for weapons. Two peacekeepers injured in the fighting have also been medically evacuated today. The Mission has further received highly disturbing reports of targeting of UN and international non-governmental organization (NGO) personnel, premises and assets in Juba allegedly by SPLA soldiers, during the recent fighting, Mr. Dujarric said, noting that the reports include allegations of a killing of at least one South Sudanese national working for an international NGO, as well as rapes, including of an International NGO staff. UN staff members have also been assaulted. The UN Office for the Coordination of Humanitarian Affairs (OCHA) also reported that three days into the tenuous ceasefire in Juba, many people have begun to return to their homes. However, thousands remain displaced, including at the UNMISS Tomping base, the UN House and the WFP compound. “The relative calm has provided a window of opportunity for humanitarian organizations to respond, and now we have visited all areas where people were reportedly displaced,” he said. Humanitarian partners are closely monitoring the evolving situation in several locations across the country, including Yei, Wau and Leer. The United Nations Children's Fund (UNICEF) and partners are also providing urgent life-saving assistance to thousands of people displaced by the heavy fighting. Primary health care kits as well as recreational items for children will be distributed today. Yesterday, four trucks of supplies, including the treatment of malnutrition as well as sanitation items such as water containers and soap, were dispatched from UNICEF warehouses and taken to a UN displacement site in Juba as soon as movement became possible in the city. High-energy food bars were also distributed in two churches where families have gathered. Teams from UNICEF and partners are also working to assess the extent of humanitarian needs and have begun family tracing for children who became separated from their parents as families fled the fighting. Given the unstable security situation in South Sudan following clashes between Government and opposition forces which left some 272 people, including 33 civilians, dead, the United Nations peacekeeping chief today proposed that the UN Mission there be extended until the end of August to allow a rapid assessment on the need for a stronger mandate.